The final topic was participants' views of license suspension as a sanction, including their views of its fairness and its efficacy in deterring future occurrences of alcohol-impaired driving. Milwaukee offenders almost universally believed that the state's license sanctions are fair. The only criticism in this regard was that judges have discretion to suspend a license for six to nine months, and several subjects were given suspensions longer than six months with no rationale provided. A substantial number of New Jersey offenders believed that state's license sanctions are unjust. Many New Jersey offenders criticized their state's law because the suspension has a greater impact on some offenders than on others. They believed that persons who cannot get to work without driving, need to drive as part of their work, live alone, or have no access to rides or public transportation are disproportionately punished. A few adults also complained that suspensions for underage drivers were shorter than those for adults. Milwaukee participants generally did not believe that the suspensions given to first offenders are an effective deterrent to future drinking and driving. Most believed that the ease of obtaining an occupational license makes the sanction rather meaningless, as driving may be hardly affected at all for persons who obtain an occupational license. The fear of a hard suspension, jail time, and greater financial penalties for a second offense, however, was universally viewed as a strong deterrent to repeating their behavior. 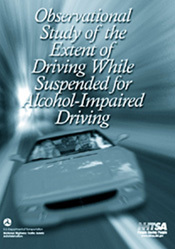 All New Jersey participants believed that their license suspension deterred them from driving during the suspension, punished them, and was an effective deterrent to future drinking and driving. However, some participants believed that other sanctions would have been sufficient to get their attention and deter them from drinking and driving. Several members of the New Jersey groups suggested that New Jersey's law would be fairer if offenders were permitted to drive in limited circumstances if they could show that the suspension would result in undue hardship, such as the loss of their job. One participant suggested that the law would be fairer if past driving and criminal records were taken into consideration in determining the length of suspension. He believed that upstanding citizens who made one mistake should not be punished as severely as those with a history of lawless behavior.